“Buboy, Buboy, Buboy!” Chants of Buboy Fernandez, lead trainer of Manny Pacquiao, reverberated through the room after he took the microphone to answer post-fight questions from the press. For many years, he was the chubby and likable figure seen behind Freddie Roach whenever the hall of fame trainer handled media obligations. This time, he finally stepped into the limelight as the lead trainer for his best friend against Lucas Matthysse – a job which he excelled with flying colors. Only few would have imagined a knockout victory for a past-his-prime Pacquiao after a nine-year stoppage drought, but somehow Buboy and the coaching team delivered. Luck as it may seem, it isn’t. Many viewers were amazed at how the Filipino boxing legend looked renewed as if he turned back the clock. The reason is relatively simple: Buboy added new weapons to Pacquiao’s already rich arsenal. Boxing enthusiasts would know that he is never renowned as a body puncher. However, apart from the counter right hook against Matthysse’s jab, Pacquiao was able to incorporate body punches when he spotted openings throughout the fight. For instance, he unleashed Errol Spence-esque right-left combos to the Argentinian’s body in the first and fifth round, something he rarely did with Freddie in charge. On the other hand, the infamous left uppercut that left everybody in awe was also a result of Buboy’s meticulous observation and planning. Knowing that Matthysse had a tendency to lean forward with a high guard, he had Manny training specifically for that punch. It is hard to recall any fight in recent years where the Filipino applied the left uppercut with such conviction, which truly validates Buboy’s keen boxing sense developed by being Roach’s apprentice. Perhaps one of the least discussed factors of victory is Pacquiao’s great lead foot positioning against Matthysse. For the majority of the fight, Pacquiao was able to place his lead right foot outside Matthysse’s lead left foot when attacking because the Argentinian often came towards the Filipino in straight lines. Other than creating punching angles, Manny’s lead foot dominance and side steps to his right allowed him to move away from the dangerous right hand of Matthysse, who found it difficult to land a Marquez-type straight right since Manny was not right in front of him. In spite of Pacquiao’s success, his coaches never got carried away. Strength and conditioning coach Justin Fortune reminded his fighter in between rounds to be mindful of Matthysse, who always poses a threat with his punching power. The Buboy-lead team was spot on in making sure that Manny fight with controlled aggression. Overall, Team Pacquiao’s game plan was much improved compared to the controversial fight in Brisbane. The corner work of Pacquiao’s coaches during this fight is equally impressive as the tactics devised, if not even more. Justin Fortune admitted in an interview that in the fight versus Jeff Horn, the corner was “a little chaotic” with “screaming and yelling”. This is detrimental to a fighter because the trainers are supposed to relay the message or advice as clearly as possible, but instead Pacquiao got no help except from Miguel Diaz trying to tend to the open cuts. In a stark contrast, the corner was well-coordinated and calm for the fight in Malaysia. Notice that at the end of rounds 4 and 6, the broadcast showed how Buboy and Justin took turns to speak to Pacquiao. The team seemed to learn from past mistakes and had calmed the storm. In addition, this might have something to do with Freddie’s absence in the corner. Buboy was always animated when working Manny’s corner in the past and likes to speak a lot. Yet, this doesn’t do Freddie any good since the lead trainer should be the main man in giving out instructions between rounds. We often see the two of them talking, sometimes even shouting, at the same time, such that Manny was probably not even listening to them but relying on himself. Therefore, Buboy’s intensity during fights sets him up perfectly as the lead trainer rather than being an assistant. Speaking of Freddie, there is no denying that he is one of the best boxing trainers in the world. Having trained a multitude of world champions, which includes turning Pacquiao from a left-handed slugger into a complete fighter, while battling Parkinson’s disease every day, he has earned massive respect in the boxing circle. However, as cruel as it might sound, it is better if he leave Team Pacquiao at this stage of the Filipino’s career. 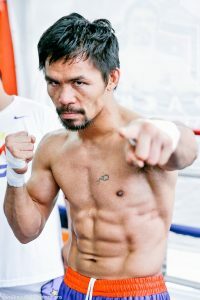 We must admit that Pacquiao is already out of his prime, and therefore having a near-perfect game plan is imperative to compensate for his decline in physical abilities. He looked decent in the third fight against Timothy Bradley and against Jessie Vargas, but the flash knockdowns were no indication that he rediscovered his dominant self. The Battle in Brisbane totally revealed an inept Freddie-led coaching team. Manny was obviously not prepared for the rough tactics of his opponent as he was often troubled by Horn’s size, especially against the rope which the Philippine senator had little success. Whether he stayed on the ropes intentionally or not, no trainer should even allow an aging boxer to try fighting off the ropes against a younger and bigger opponent. Terence Crawford took the chance to demonstrate what being prepared for Horn means. Despite Pacquiao winning the fight in many people’s eyes, it was a far cry from what we all expected. To be honest, Pacquiao’s recent fights under Freddie Roach were underwhelming because it seemed like the American trainer never had any particular game plan for each fight, but rather, only relying on the Filipino’s talent and experience, plus a general tactic of boxing “in-and-out”. After Buboy took up the reins of the training camp, we saw a seismic shift in terms of the tactics. Pacquiao fought with a specific game plan structured around the tendencies of his opponent and found the effective punches. Freddie would have asked Manny to box Matthysse as we would have expected, but Buboy and Justin wanted the opposite – to go first and be proactive. The knockout victory was not merely the icing on the cake, but it exemplifies the difference between applying a general and a distinct game plan. Moreover, probably as a result of his age, Freddie does not seem to have the fire in him anymore. Pacquiao bore the brunt of Horn’s headbutts throughout their fight, but Buboy was the only one in the corner to protest against the referee. Rewatch what happened after the end of the seventh round and you can see Buboy furiously hitting his own head repeatedly as a signal to the referee about Horn leading with his head. Freddie made no attempt whatsoever to complain in order to protect his fighter, which he constantly did so in his best years with Pacquiao. After the fight, the American appeared resigned to the defeat with his interviews and comments. All of these point to the sad truth that Freddie is no longer a good fit with the Filipino icon. Credit must be given when it’s due. Prior to the fight in Malaysia, question marks were all over the place with the absence of long-time trainer Freddie Roach. However, Buboy Fernandez, Justin Fortune and Team Pacquiao reassured us that all is good. Manny followed their well-designed stratagem, suffocated Lucas Matthysse’s offense which led to a long-awaited stoppage at 39 years old. It was so astonishing that it had haters coming up with a plethora of excuses to discredit the victory. In the twilight of Manny Pacquiao’s distinguished career, it is only right for Freddie to pass the trainer’s torch to Buboy for one last hurrah.